For over 120 years, people have been gathering at this location to come closer to God. From the church to the gardens, from the rectory to the convent, clues to the origin, the influence, the past and the present of Our Lady of Perpetual Help Catholic Church, an Ybor City jewel, abound. In the midst of a beautiful triple panel stain glass window located in the choir loft is a stunning rendition of the Sacred Heart – clue #1. A glorious depiction of The Annunciation, rendered in stained glass, is one of the windows that illuminates the sanctuary of Our Lady of Perpetual Help Catholic Church – clue #2. Jesus with the little children, a touching scene from the New Testament, is one of OLPH’s beautifully colored stained glass window in the east wall which helps to illuminate the nave of the church – clue #3. 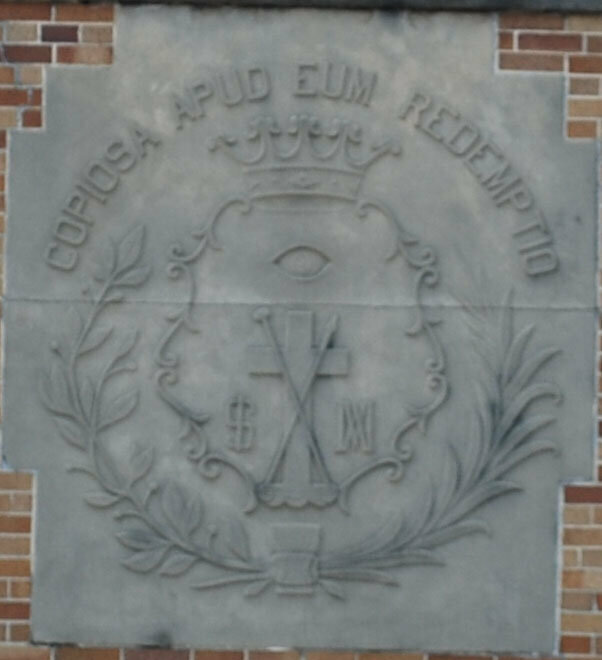 Copiosa Apud Eum Redemptio – the Latin motto which is part of an architectural relief in the brick façade of Our Lady of Perpetual Help Church – clue #4. A striking image of Our Lady of Perpetual Help greets all who enter the main doors of the church. Resplendently portraying, Mary, Our Lady of Perpetual Help, along with referential images below her, this window is the center and pre-dominant stained glass window in the sanctuary – clue #5. Wrought of iron, standing next to the 11th Avenue sidewalk, for generations it beckoned children of the vibrant immigrant cultures of Tampa– clue #6. The wrought iron fence in front of the Rectory bears a medallion that is a testament to OLPH’s past and present – clue #7. The Jesuit fathers of Our Lady of Mercy Church guided the parish from its inception until 1926. In the 1890’s, the Sisters of St. Joseph established a private school, St. Joseph’s Academy, located on the property of Our Lady of Mercy Church, the academy’s neighbor and patron. Later renamed Our Lady of Mercy Catholic School, the institute became the parish school. Italian-speaking priests of the Salesian Order took over stewardship of Our Lady of Mercy (OLM) parish in 1926. Testament to the diversity of the parish was evidenced by the Italians, Cubans and Spaniards who attended Our Lady of Mercy Church** and school. In 1934, the Redemptorist Order took over guidance of the parish. 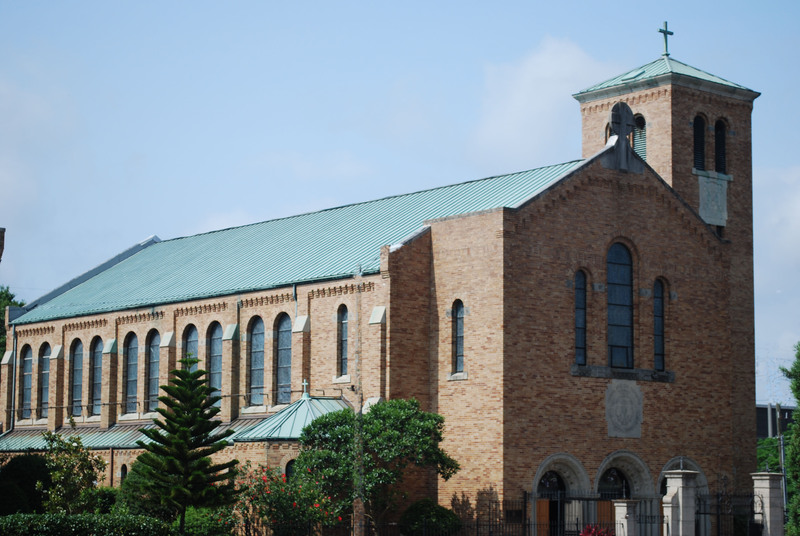 In 1937, a new Romanesque* style church was constructed on the site of the original wooden church, Our Lady of Mercy. The new church was named Our Lady of Perpetual Help (OLPH), a reflection of the Redemptorists’ devotion to Mary, Our Lady of Perpetual Help. The name of the parish’s school was changed from Our Lady of Mercy Catholic School to Our Lady of Perpetual Help Academy. The Diocese of St. Petersburg assigned a diocesan priest to Our Lady of Perpetual Help parish in the early 1980’s. In 1986, the Society of Mary – the Marist Fathers – took over stewardship of Our Lady of Perpetual Help Catholic Church and its congregation. Father Thomas Stokes, S.M. served as pastor from 1986 until his retirement in 2012. Father Stokes was succeeded by Father Roland Lajoie, who served at OLPH until January 2017. Father Hector Cruz is the current pastor of Our Lady of Perpetual Help Catholic Church. Clue #1 – Though nothing remains of the original wooden structure of Our Lady of Mercy Church, an acknowledgement of the stewardship of the Jesuit Fathers, who guided the parish from inception until 1926, is present in the current church. Clue #2 – In the 1891, the Sisters of St. Joseph opened St. Joseph’s Academy which was located on the property of Our Lady of Mercy Church, the academy’s neighbor and patron*. Later renamed Our Lady of Mercy Catholic School, the institute became the parish school. The Sisters of St. Joseph donated funds for the creation of The Annunciation stained glass window. Clue #3 – The children of Our Lady of Mercy Catholic School raised funds to pay for one of the Austrian hand-crafted stained glass windows*** for the new church. Clue #6 – Thousands of children walked beneath the Our Lady of Perpetual Help Academy sign and into Our Lady of Perpetual Help (OLPH) Academy. The school was an extension of the richly diverse and multi-cultural community it served and had a significant spiritual influence over the many children that entered its doors. For more information on Our Lady of Perpetual Help Academy, please go to the Our Lady of Perpetual Help Academy page on this website. 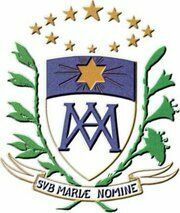 Clue #7 – The medallion is the seal of The Society of Mary – the Marists Fathers. Marist fathers have devotedly guided Our Lady of Perpetual Help Catholic Church’s parish from 1986 to current day.